Uplifting and positive a feel good track. Never give up even when things look bad. 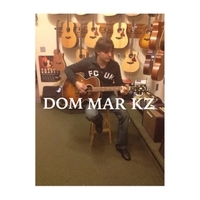 Dom Mar Kz is a singer song writer from Toronto Canada and has been playing and writing music for over 20 years. Dom has toured though out North America and England. His biggest tour was the support act for the legendary Scorpions. Dom has also opened for bands like Bon Jovi, Def Leppard, April Wine, HoneyMoon Suite and many more well know artists. In 2010 Dom Mar Kz and his band MAR KZ recorded their debut album in Nashville TN. It was produced by Obie O’Brien, long time Producer/Engineer for Bon Jovi. The album was well received by radio and fans alike. Dom Mar Kz crafts his music from the heart, taking life experiences, true emotions and storytelling into every song and lyric. His songs are best described as; “music that will take you on a journey though life, love, faith, dreams and Rock & Roll”.